Newton's Nook Designs: July Reveals - Day 4 - FIVE new mini stamp sets! Today is day 4 and our Final reveal day for our new July product reveals! Today we are sharing a fun NEW SIZE for our stamp sets. Check out our new mini 2x3 sized stamps! These cute little stamps are so adorable you'll want to collect them all! Scroll down to see them! We are also giving away a $20 store credit each reveal day to one lucky winner so make sure you read all the way to the bottom of this post to see how to win! 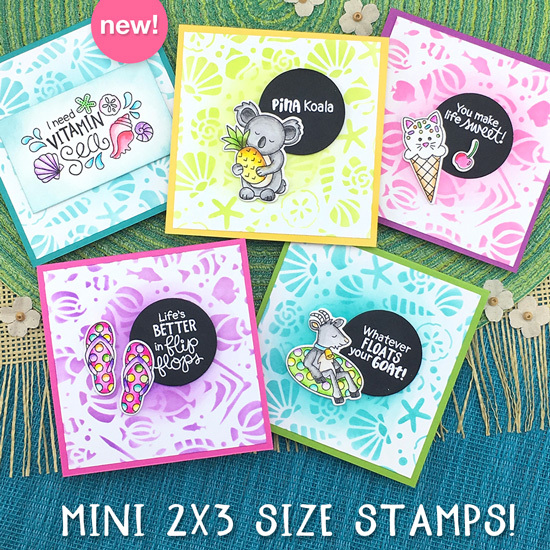 Our new mini 2x3 stamps are so cute you'll want to collect them all! We are starting this new collection with FIVE fun new summer themed sets and four coordinating die sets! The designs are: Flip-Flop Life, Cat Treats, Vitamin Sea, Pina Koala, and Floaty Goat! These adorable mini stamps pack a big punch! Check out what our Design Team created with these! 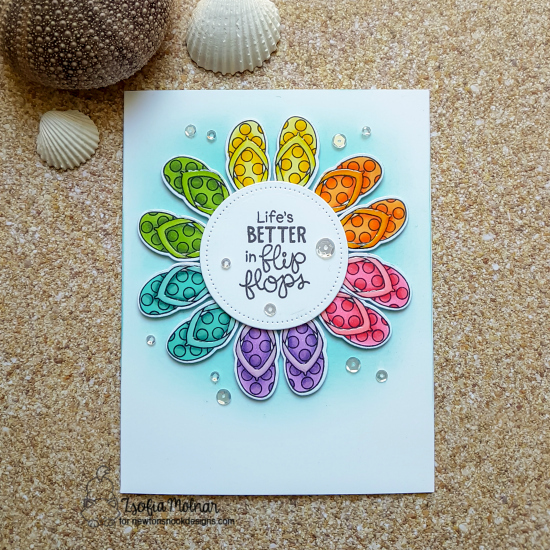 Zsofia created a whole rainbow of flip flops using the new Flip-Flop Life Stamp Set! She cut them using the coordinating die set and arranged them in a circle around the sentiment! So cheerful and perfect for summer fun! 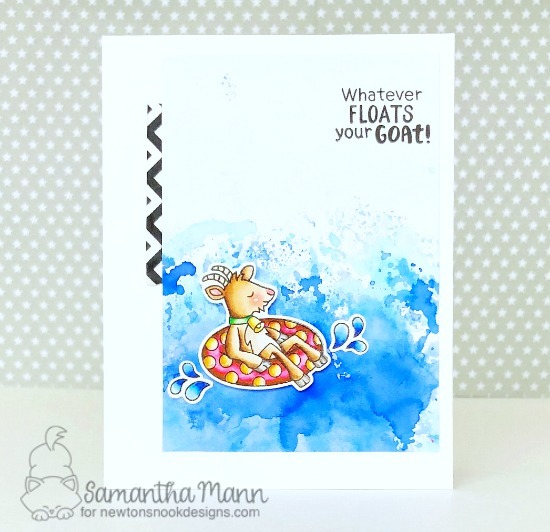 Samantha used our new Floaty Goat Stamp Set for this fun summer card. She colored the goat and cut him out with the coordinating die set. Then she added him to her card with a fun watercolor background! So cute! 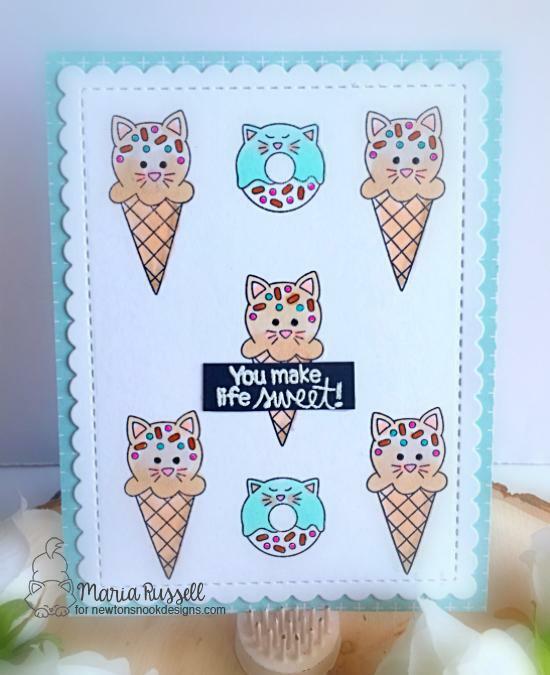 Larissa created this fun card using the new mini Cat Treats Stamp Set. She used the cat ice cream cone and colored it for her main image. She also used the ice cream and cherries to stamp a fun background pattern along the bottom and the Sunscape Stencil to create the light pink sun rays across the top! 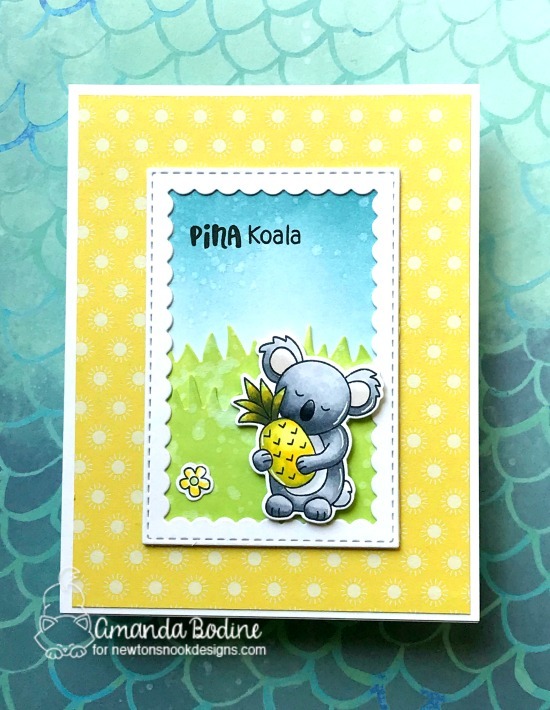 Amanda created an adorable little scene using the new Pina Koala Stamp Set. She colored the Koala bear and added him inside the frame from the Framework Die Set. She also used our Land Borders Die Set to create layers of grass! How adorable! 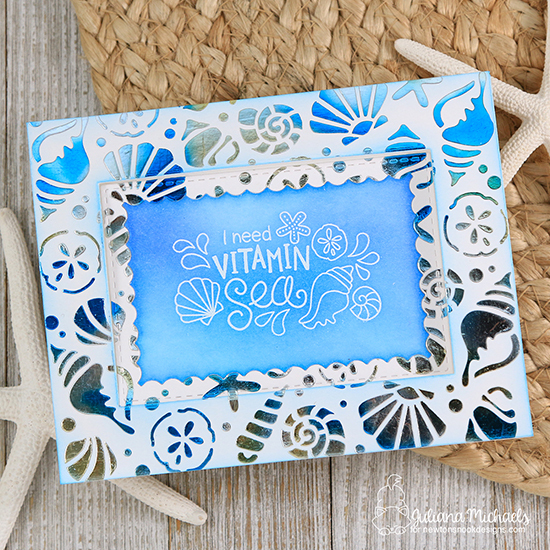 Naki created this adorable mini décor piece using our Vitamin Sea Stamp Set. 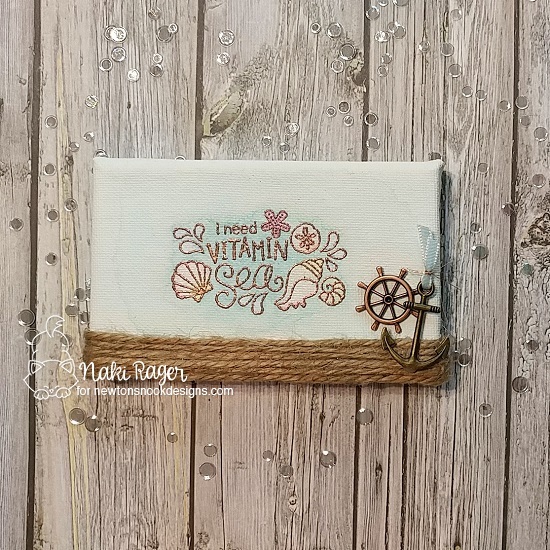 She stamped the sentiment onto a mini canvas, embossed it in gold and colored it with soft pastels! She then added some rope and metal embellishments to finish off her decoration! So unique and pretty! 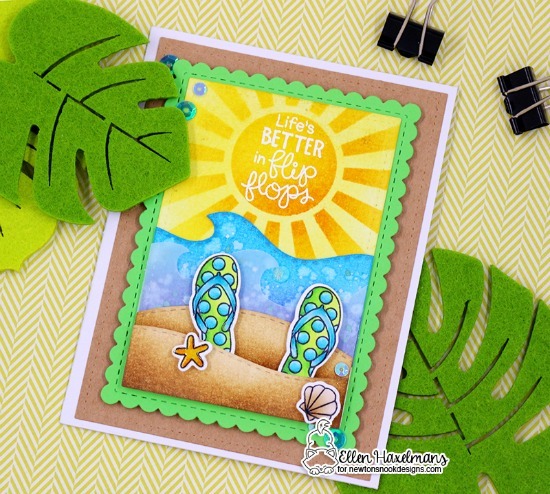 Ellen created an amazing sea scene featuring the flip flops from our new Flip-Flop Life Stamp Set! She colored the flip-flops in fun bright colors, cut them out with the coordinating Flip-Flop Life Die Set and added them to a beach scene. She used our Land Borders Die Set to create the sand and our Sea Borders Die Set to create the waves. She added in the sun rays using the Sunscape Stencil. She also used the Scallop edged frame from the Framework Die Set. Tatiana created this yummy summer card featuring our new Pina Koala Stamp Set. 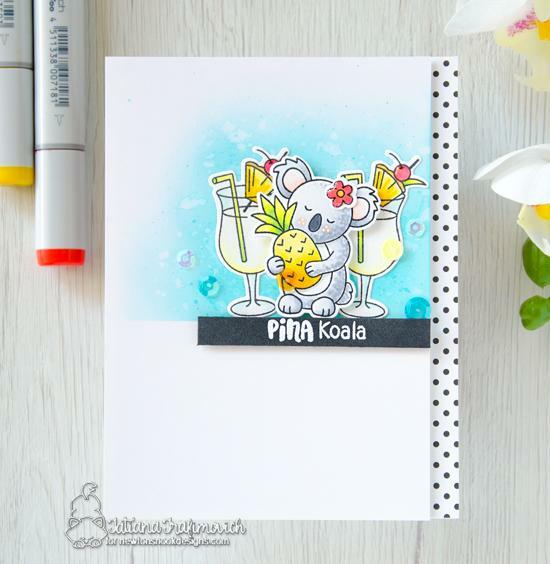 She colored the sweet Koala bear and added him to her card along with two tropical drinks that were stamped using our Cocktail Mixer Stamp Set. Such a perfect pairing of stamps! This adorable card was created by Maria using our new Cat Treats Stamp Set. She stamped the kitty ice cream cone and donut in a cute pattern and colored them in shades of brown with pops of teal and pink! She added the sentiment, embossed in white on black in the center. She also used our Frames & Flags Die Set for the scallop edged panel. This gorgeous card was created by Juliana. She used our new Vitamin Sea Stamp set as the center focal point, embossing it in white and inking over it with blue tones. Then she used our Seashells Stencil with foil to create that amazing background. She also cut out the little scallop edged frame using our Framework Die Set. 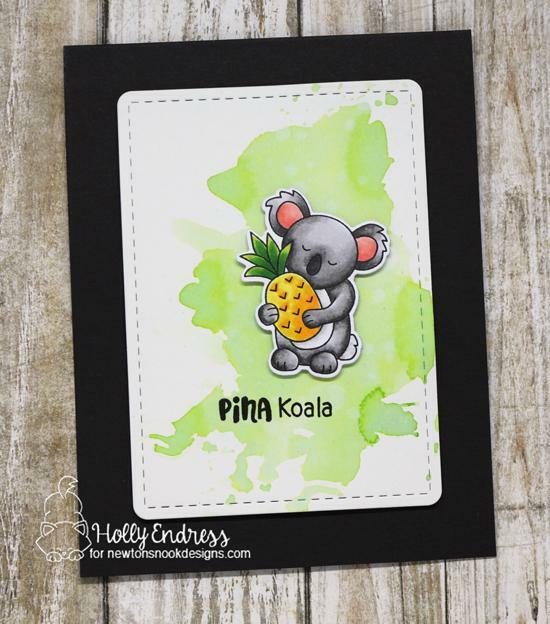 Holly used cute our new Pina Koala Stamp Set to create this sweet and simple card! She colored the Koala and cut him out with the coordinating Pina Koala Die Set. Then she added the image onto her watercolor panel for a fun and simple card. She used our Frames & Flags Die Set to cut out the stitched rectangle panel. oww how cute are those!!! love the flipflops and the kitty icecream!! Squeee... kitty kones!!! Purrfect!!! Everything else is darling, too, but KITTY KONES (aka Cat Treats)!!! What a great idea to create these mini stamp sets...love those flipflops! These new mini sets are so fun and absolutely adorable!!! What a great week with tons of inspiration and amazing new products!!! OH must have all of these new mini guys!!! Love them all. I like to do the little 3x3 cards for my shop and these are perfect! Cuteness x 5! I just love all of these cuties! The DT ladies have showcased them wonderfully! are such fun. Fantastic release. Wow! Super cute stamps! Perfect to make adorable summer cards!!! Cute cards with these mini sets. Oh !! I love these new cute mini sets ! The Cat Treats are absolutely irresistible!! This was another fantastic release ! Congratulations !! Love these stamps. Especially since we live in Florida!! Can’t wait to get them!! Love, love, love these awesome and sweet and super adorable sets! All of them ... just like you said. lol The kitty-cone and donut ... my favorite! OMG, Naki's project is out of this world crazy fabulous!!! These are so cute! Ideas for these mini sets are endless. Tomorrow will be a busy deciding which sets to purchase from this weeks reveal. Great Job D.T.! AWWWWWW these are ABSOLUTELY ADORABLE new stamp sets! Whatever floats your goat and Life's better with flip flops! Hilarious! Such cute stamp sets. Love all the cards. The minis are so much FUN! 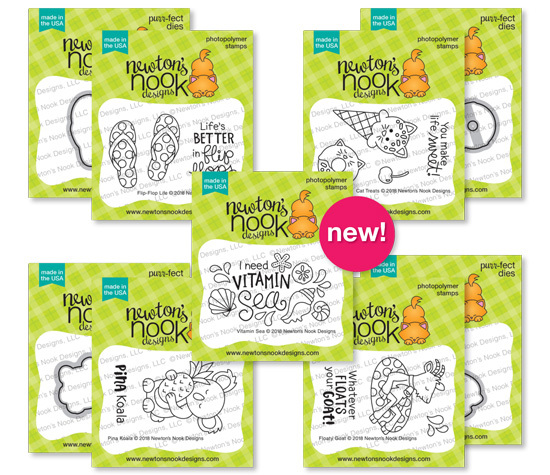 Great new additions to the Newton's Nook product line and wonderful inspiration as always. love those cute mini stamps! all cards from team are super amazing! I LOVE the flip flops and koala so much! Very cute new stamps and cards! Thank you for sharing this amazing Blog Hop. Very cute little stamp sets! Love the adorable cat ice cream cone & donut! Congrats on your awesome 5th anniversary July release! I love these new mini's, especially the kitty cones. Happy 5Th Birthday!! So much cuteness in this release! I am smiling from ear to ear! I will be needing the kitty ice cream and donut stamps for sure! Love, love, love all the new stamps! Your cards are adorable and your team did an amazing job - again! ADORABLE images! Fantastic inspiration projects too! What a lovely collection ! They are all more adorable the one from the other ! And all the cards from your DT are fantastic.